Lennie's Diary - 1898: Lennie Notes a "Hot Time in Cuba"
A hot time in Cuba. A pack of boys went up the (railroad) track for a walk. I was getting up a party when the wind began to blow. Had a party at Ellis Paulson. I fixed my (bicycle) wheel and took a ride. Staid home and worked books. 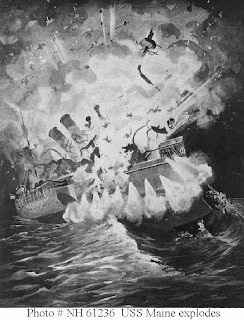 In world news, the Omaha Bee continues with multiple front-page stories about the USS Maine which, as you remember, sank in Havana Harbor due to an explosion on February 15, 1898. There is considerable discussion as to the cause of the explosion, whether something internal or external to the ship. This event will lead to the United States soon declaring war against Spain. You can go to this site to read a portion of Samuel Willard Crompton's book, The Sinking of the USS Maine: Declaring War Against Spain. In local news (page 2 of the Bee) we read that in Dakota City, Nebraska, "A stranger was today lodged in jail by Sheriff Borowsky, charged with burglarizing the hardware store of Brustkers, Krietle & Bahl of Emerson (Nebraska) on the night of the 19th. The stolen goods were found in a haystack near Emerson and the man was in the act last night of getting them out when arrested. He resisted arrest and was given a fight before being subdued." In its editorial section, the Omaha Bee comments on the potential new police station in Omaha with the following statement: "When we get a new police station the next thing in order will be to get a few police officers worthy of the name to direct the force." A sly commentary, that one. And in regards to settlement of the western states, the Bee opines, "Not all of the persons who travel westward over the transcontinental railroads are bound for the Klondike (the gold rush). Many of them are seeking new homes in the western states, where land is cheap and good crops the rule. Between the Mississippi River and the Pacific Ocean there are millions of acres awaiting the magic touch of the farmer to bring forth riches."